"According to recently released numbers from DisplaySearch, the iPad is taking over, and netbook sales continue to crash. From the second quarter of 2009 to Q2 of 2010, sales of clamshell mini-notes with 10-inch displays were down 8 percent to 6.5 million units." 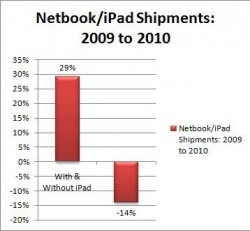 The graph is a bit confusing, but the bottom line is that the iPad appears to be drawing buyers away from netbooks. According to DisplaySearch, from Q2 of 2009 to Q2 of 2010, netbook (clamshell netbooks with 10-inch displays) sales dropped eight (8) percent to 6.5 million units sold. The article states that over the same time period Apple sold 3.3 million iPads. A slight problem in the statistics, since the iPad wasn't available until April 2010. But the underlying meaning is clear, buyers are looking for something portable. DisplaySearch predicts tablet growth "as much as 41 percent" from this year to next. Even though I own an iPad, I won't replace my "business netbook" with a tablet until I can get one that runs MS Excel and Word. I guess that means that I wait for a Windows 7 tablet ... Come on HP!